For centuries, the Mesoamerican reef in the Caribbean Sea has welcomed over 500 species of corals, fish, and other sea creatures. 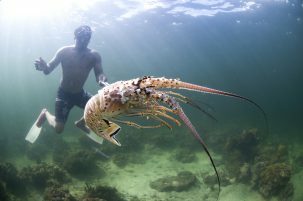 Linked to commercial and recreational activities from fishing to snorkeling, the marine wildlife boosts the national economies of the countries whose coastlines the reef touches. Warm-water coral reefs—composed of stony corals, algae, and other organisms—are classified as a “unique and threatened” ecosystem that is especially vulnerable to temperature change, according to a recent special report from the Intergovernmental Panel on Climate Change. “Coral reefs are already experiencing damage [from climate change], and they’re projected to experience significantly more damage, even at temperature rises of 1.5 and 2 degrees Celsius” above pre-industrial levels, according to Cynthia Rosenzweig, senior research scientist at the NASA/Goddard Institute for Space Studies and at the Earth Institute’s Center for Climate Systems Research (CCSR). 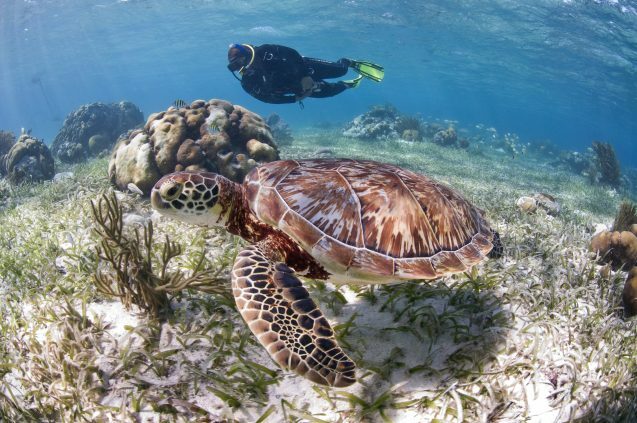 Rosenzweig’s team is partnering withWWF and the national governments of Mexico, Belize, Guatemala and Honduras, the four countries that border the reef. The aim is to strengthen the resilience of the coastal and marine systems of the Mesoamerican Reef. As part of the ADVANCE partnership, the project will enhance climate expertise in the region, and assist in research, monitoring, and designing adaptation strategies. The hope is that the corals of the Mesoamerican reef and its coastal communities will be able to withstand warmer sea surface temperatures, ocean acidification, sea level rise and coastal flooding in the decades to come. “Our objective is to provide climate risk information to guide climate-smart protected-area planning for the coastal and marine areas of those countries,” said CCSR senior staff associate Manishka De Mel. Ocean warming brought on by higher air temperatures is equally hazardous to the Mesoamerican coral reef. Extended periods of 30-degree water temperatures—just a cut above the average temperature of the Caribbean Sea—can cause the corals to become “stressed” and release algae from their tissue, Bood said. When that happens, the corals, which derive 90 percent of their nourishment from algae through photosynthesis, can starve to death. “If the corals die, the fish will leave, too, because they will seek out healthier environments—so you’ll lose the biodiversity of the reef,” said Bood. To counter these phenomena, Bood says the scientists intend to devise a mix of “green” and “gray” adaptation measures. For one, they plan to inform land developers of coastal areas about how they can use a combination of vegetation, natural barriers, and hard infrastructure to simultaneously guard their properties from sea level rise and climate events, and to promote ecotourism. 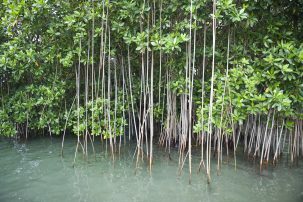 “They may decide to conserve 25 to 50 percent of the mangroves on their properties and build a bridge or boardwalk, so [tourists] can come in and view the nature and wildlife within the mangroves,” suggested Bood. “They could also use large rocks to help stabilize and beautify their coastlines.” For coastal areas that are quickly eroding and that do not have suitable habitats for vegetation, hard infrastructure such as sea walls may be the only remedy. In the first phase of the four-year-long project, the scientists will analyze climate and ecosystem risks. Climate models provided by CCSR will estimate future changes in ocean and sea surface temperatures, frequency of rainfall, sea level rise and coastal flooding over time. In addition, the partners will host at least three workshops with local residents, community organizations, businesses, and government agencies to learn more about how these groups are experiencing the impacts of climate change, and what they see as the main threats in the future. Then the project teams will work with these local stakeholders to design and implement adaptation strategies. CCSR plans to release its initial findings in fall 2019. This project is supported by the International Climate Initiative of the German Federal Ministry for the Environment, Nature Conservation, and Nuclear Safety.